Note The Traditional Shar Pei is not officially a separate breed from the more well known Shar Pei. Shar Pei Breeders & Puppies For Sale If your a Shar Pei breeder and have Shar Pei puppies for sale, send us your details for free and we will add to our Shar Pei Breeders page. Shar Pei Rescue Center Visit the Shar Pei rescue centers if your looking to rescue a Shar Pei, as well as learn more about the breed or just support the rescue centers for there hard work. Origin / History The Shar Pei is an ancient breed, possibly dating back to The Han Dynasty (206 BC to 220 AD), in which it can be seen depicted in statues from this period. The original type of Shar Pei originated from Dali,in the Guangdong province of China. Its less wrinkly that the Western Shar Pei and is sometimes referred to as a Bone Mouth Shar Pei. What the breed were used for depended on the areas of Asia they were bred in. In rural areas they were used within village life, in help of guarding the village and going out on hunts with villagers. 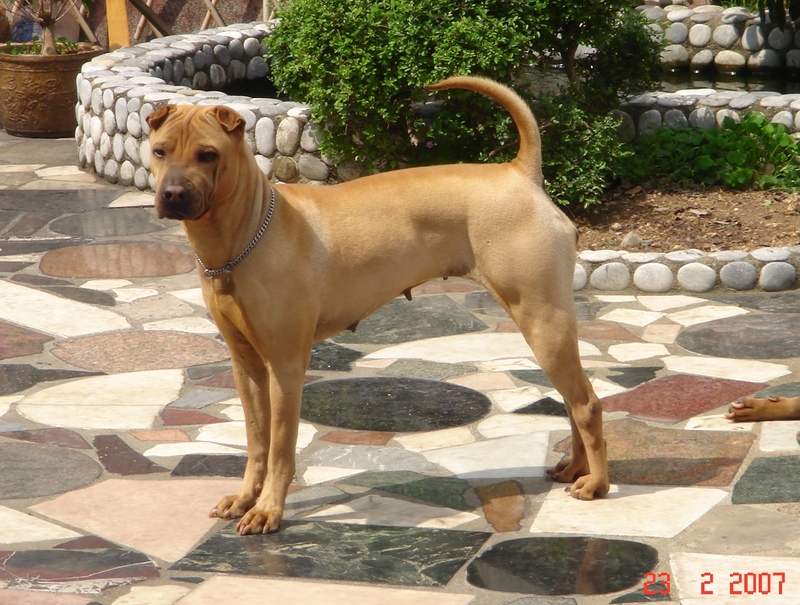 Where they were bought up and bred in urban areas such as in Hong Kong they have commonly been used as a "Chinese Fighting Dog". In 1973 the breed was becoming extremely rare and was close to extinction. A man named, Matgo Law called on the Western world, most notably the U.S to help "save the Chinese Shar-Pei". Within just a matter of years, what I will call the Western Shar Pei had been transformed into a softer and much more wrinkly breed, which may well be cuter on the eye for prospective buyers but also comes with a large number of health problems caused by irresponsible and over breeding. Mostly due to the very high prices which puppies could be sold for in the 1970's and 80's. The breeds haven't officially been split into 2 different breeds, so it causes alot of confusion between the types of breeds which are viewed so differently by some, especially those from Asia who tend look in disbelief at what the Western world has done to the breed. Appearance The traditional Shar Pei has wrinkles on its face and head but to a much lesser extent that the Shar Pei we see in the Western world. The ears are proportionally small to the head size and positioned on the head above the eyes. There's less padding around the muzzle, most notably there should be clear smooth curved surface on top of the muzzle like the vast majority of normal dogs. The tail should be set high and pointing towards the head. Colours For color, traditional Shar-pei has solid color of Fawn and black (or named by Chinese rusty black). What it means is a black with tint of reddish rust tone. The closest to your Western color description may be is the "seal color". There can be sometimes diluted color called "Five point red" is also acceptable. Light fawn and light cream is also acceptable provided with proper pigmentation of nose, tongue and ear (light cream dog should have darker fawn color ear). A completely white dog is not acceptable. Temperament. The traditional Shar Pei is a working dog so expect it to be territorial, retain its guarding instinct and be very alert. they would of course make good guard dogs. Common Health Problems The Traditional Shar Pei is much healthier than its Western world counterpart and doesn't suffer from any specific health problems. Living Conditions Can live anywhere, town, country, house or apartment. Of course if in an apartment will need extra exercise. More active than the Western world Shar Pei so. Exercise Requirements High energy working dog which enjoys regular walks. Training Requirements Need firm obedience training and good leadership. Life Expectancy10 - 12 years. Grooming The traditional Shar Pei only comes in the Horse coat type which is the shortest of the three known coat types that exist across al Shar Pei's. CompleteDogsGuide Comment In the Western world we think of Shar Pei as a single universal worldwide breed, however there are stark differences between the very wrinkly, meat faced Shar Pei we see in the western world with numerous health problems bought about by poor breeding from the Traditional and naturally much more healthy Traditional Chinese Shar Pei. Therefore we have dedicated a separate page to this specific breed. Owners Comments: (All info thanks to Eric from hkshar-pei.com). More Shar Pei Information: Check out our Shar Pei Clubs and links to more informative web sites dedicated to the breed. Eric from hkshar-pei.com explains below how he perceives the differences between the two types of Shar Pei. When Christopher Columbus "discovered" America (Central America to be exact) in 1492, he named the native people he saw Indians. He was on his westward expedition to find a new route to Asia. Today we call these native people American Indians. Ask Indians from India if they agree with Columbus that those people he saw was Indians? So in order to clarify what Columbus really means, we call them American Indians. Then a couple of hundred years later, American thought they have found the Akita dogs. Apparently the Japanese Kennel Club did not think so. So we now have the American Akita and the Japanese Akita in much the same way as the American called their native people American Indians and the Indians in India the usual Indians. Cocker Spaniel is a little more simple because American and British are historically very much similar and so much more difficult to mis communicate. So they differentiated the breed into American Cocker and English Cocker without much difficulty. American could not have confused British for something else. For Shar-pei, the Western world is still living in the age of Columbus. The majority of them still insist that they have "discovered" a rare breed in China called Shar-pei and named it Chinese Shar-pei (as the name CSPCA implies) which is similar to Columbus claiming he saw the Indians. As there were no consensus yet at that time on what to call the Northern great continent of America, he could not have referred to the natives as "American Indians" to differentiate them from the Indian Indians. 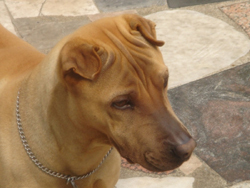 The Shar-pei photo you have put on your Western Shar Pei web page is a nice dog with good traditional Shar-pei (we call bone mouth or the original Shar-pei we see in China) but not the color. Traditional Shar-pei DO NOT have Blue color, hippo face and brush tail. 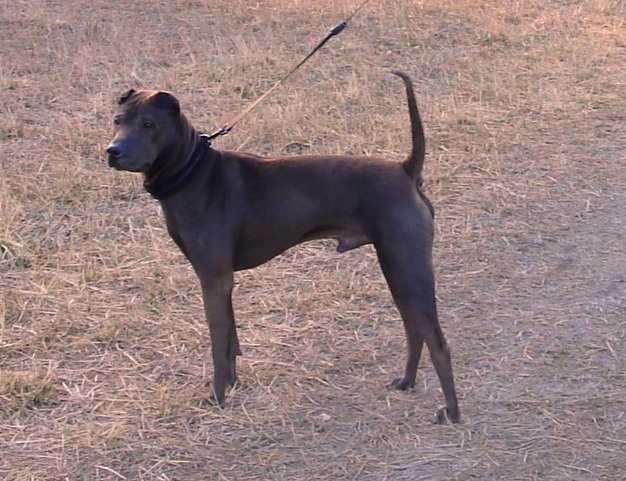 Blue is something of Western origin and possibly from Neapolitan Mastiff. The early Chinese breeders in Hong Kong, Taiwan and in U.S. must have crossed with Shar-pei to produce the more massive face, meat padding (and therefore we call the Western type Shar-pei Meat-mouth), wrinkles on face and thus follow with all these features also the color. This was what happened in the 1970's and 1980's when Shar-pei was HOT in U.S. and many people made a fortune by breeding these wrinkle meat-mouth dogs.